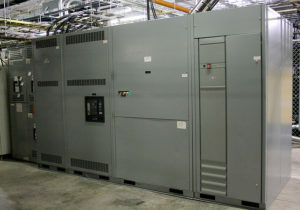 UPS systems are the heart of your critical infrastructure. They condition, monitor, and filter incoming utility power, and when the power goes out, the UPS system supports the load itself with internal batteries. They are sensitive pieces of technology that contain hundreds of parts, including capacitors, batteries, and controls, all working together. These systems ensure that your critical loads are protected and backed up 7 days a week, 24 hours a day, 365 days a year. The major risks associated with operating older UPS units are component fatigue, parts availability, higher service costs, and higher downtime risk. But with proper servicing, a UPS can operate safely and reliably. If it’s over 12 years old, its age coupled with the numerous efficiency improvements of newer models make a compelling argument for replacement. If loaded between 25-80% – you’re in just the right range. If loaded less than 25% – you’re wasting energy and money. Improving energy efficiency is one of the key components for ensuring cost-effectiveness in your critical infrastructure. Achieving 92% UPS system efficiency is good, but it could be better. Today’s UPS systems are realizing 97-98% efficiency. You’re wasting money if you’re achieving less than 92%. For example: If you increase the efficiency of a 100kW UPS system from 92 to 97% you can save up to $5000 a year in operating costs (at $.10 kWh). Batteries are vital in the 24/7 operation of the UPS. However, the capacity decreases over time based on usage, environment, and cycles. Preventative battery maintenance will not only extend the UPS system’s life, it also allows you to see if a battery will fail from a defect or deteriorationbefore it becomes an emergency. This is important because the costs to replace a string of batteries can be very expensive – sometimes 40% of the value of a new UPS system. Proactive battery maintenance also helps eliminate downtime and contributes to a “highly available” infrastructure. Replacement and installation by certified technical service labor and EPA-approved recycling of old batteries. 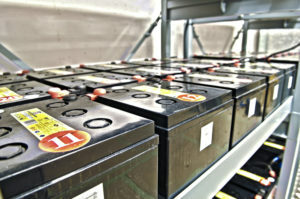 Battery Monitoring Systems – CEG utilizes a unique approach to battery monitoring that allows us to monitor cell voltages, internal resistance, and temperature; remotely monitor the battery system and provide immediate failure warnings; record up to 120 days of battery history and analyze trending analysis; and thoughtfully budget for replacements. Within your IT infrastructure, a UPS system is a critical investment. CEG’s specialists can help evaluate your IT growth, power needs, downtime exposure, and cost of ownership to determine if a new UPS system is appropriate. If not, we can help extend the life and efficiencies of the one you’ve got. We have the expertise to rightsize existing power infrastructure, provide preventative maintenance services, and perform rapid repairs. Get in touch with us today to learn more.